Gold took a backseat in 2017, as risk assets like equities soared and bitcoin emerged. But gold has been quietly doing its job for investors in recent years - as an insurance measure for portfolios. The price of the bullion appreciated 13% in 2017 to trade above $1,300. It’s up more than 25% from its latest trough at the back-end of 2015, but has traded as high as $1,900 in recent years. Now, as equity markets look toppy, leading investment experts are becoming more positive on the outlook for gold. “It’s certainly something we’re warming to,” says Rory McPherson, head of investment strategy at investment manager Psigma. Short-term factors that would increase the appeal of gold include higher inflation, as gold is widely seen as a hedge against rising consumer prices; and a pick-up in geo-political tensions around the world. The spectre of rising interest rates and tapering of central banks’ quantitative easing policies will also bolster gold’s allure, according to Russ Mould, investment director at AJ Bell. He says the widely held belief that tighter monetary policy is not good for gold is “a total fallacy”. In fact, he asserts, during the eight cycles of falling Federal Reserve funds rates, gold has on average gained 3% between the first and last cuts. However, during the seven cycles of higher rates, gold has on average gained 86% between the first and last increases. “Gold is already up by 23% since Janet Yellen sanctioned the first hike of this cycle back in December 2015,” Mould adds. The potential long-term decline of the US dollar is another tailwind for gold, says Tom Becket, chief investment officer at Psigma. “I think the end game for the US dollar has already started,” he claims. This would boost gold for UK-based investors because they buy gold in dollar terms. Places like Russia and China are de-dollarising their economies. It was claimed last week that China would slow or halt purchases of US Treasuries, sending shockwaves through the bond markets. Becket says any following through of the threat would be bad for the dollar “given the Chinese are basically funding the US deficit”. While China swiftly refuted the speculation, the shift of power from the US to the Far East is rapidly gaining traction. Becket expects China to usurp the US as world leader in both finance and politics sooner rather than later. All in all, Becket foresees a much weaker dollar over the next 15 to 20 years. “We’re going into a very interesting environment and in that environment gold could well be your best-performing asset,” he continues. Both Becket and Mould agree that the way to take advantage of this is through gold mining companies, rather than bullion. Becket notes that these companies are currently “significantly undervalued by comparison to gold bullion prices”. Investors can buy individual gold stocks, but there are few listed in the UK and they come with a higher risk warning. There are just two gold miners in the FTSE 350, Randgold Resources (RRS) and Centamin (CEY), while Fresnillo (FRES) produces gold as an offshoot to its silver mines. But Mould points out that the world’s largest gold miners by market cap – Barrick Gold (ABX), Newmont Mining (NEM), Franco-Nevada (FNV) and Newcrest Mining (NCM) – are listed in North America and Australia. A lower-risk way to play the theme is through collective vehicles, such as passively or actively managed funds. Psigma’s current fund of choice is the active First State Global Resources. While it’s not a pure-play gold offering, it currently has 15% of its portfolio in gold miners, including a top-10 position in Franco-Nevada. “We believe the fund is well placed to capture a large proportion of any upside, whilst also protecting client assets in more difficult market conditions,” says Daniel Adams, senior investment analyst at Psigma. Mould says BlackRock Gold and General is the most well-known fund investing in gold miners. Morningstar analysts rate the fund Gold. The fund, managed by Evy Hambro, aims to find companies offering the best exposure to commodity prices within an acceptable level of risk. 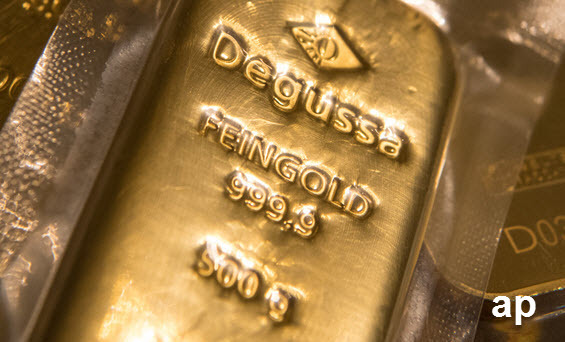 “The fund continues to be a strong choice for investors seeking mainstream gold and precious metals equity exposure in a risk-controlled manner,” says Morningstar analyst Fatima Khizou. Other active options include Smith & Williamson Global Gold and Resources, Investec Global Gold and Ruffer Gold. “For those who believe gold miners are cheap relative to gold – and who are prepared to take on the additional risk posed by miners’ operational gearing to the metal’s price – there is the option of a tracker fund,” says Mould. These are “designed to deliver the return generated by a basket of miners, minus the instrument’s own running costs”. Examples of these include ETFS DAXglobal Gold Mining (AUCO), iShares Gold Producers (IAUP), VanEck Gold Miners (GDGB) and VanEck Vectors Junior Gold Miners (GJGB).